Some records indicate Sarah was born around 1854 in Ohio. 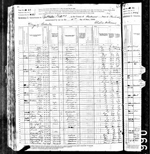 The 1900 census gives Sep 1856 in Kentucky, with her father born in Germany and her mother born in Ohio. [S18885] 1860 US Census, Div. 2, Spottsville, Henderson Co, KY.